What's your prized UAB possession? / What's your prized UAB possession? RE: What's your prized UAB possession? Mine would have to be my game used football helmets from 2014, but a close second/third would be my gene bartow psa certified auto and LSU 2000 program. I'm also a big football card collector so I have several rookie autos and cards from our players. Also if someone still has any extra bobbleheads I could use these: hard to find blaze, steve mitchell, oliver robinson, and jerome mincy. I have half a dozen of the new blaze bobble heads given out last football season I believe. Never got one of the Snoozy's version of the blaze bobble head. (08-17-2018 10:03 AM)LairDweller Wrote: 2 degrees (obviously prized). The ball D. Hackney threw into the stands after the coin toss of his last home game (if I hadn’t caught it, pretty sure it would’ve broken my friends nose). What’s the story behind Hack throwing a ball into the stands following the coin toss? Nothing exciting about the story, really. He carried a ball with him out to midfield. After the coin toss, he took a couple steps towards the sideline, pointed up into the stands, and unloaded his cannon. I think relatively few people even realized he threw it (I mean, who really watches the players walk away after the toss), including the friend next to me, who would’ve taken the ball right to the head if I hadn’t caught it. signed ticket by Coach Ehsan from this years victory of Memphis. my daughter was tip off girl for game, and she developed her deep disdain for Memphis, and her green and gold passion this game! Love this thread. If you guys have pictures please share. Go blazers! I've got a gold and a white one. Wish I could find one from last year. I've got an "LS Who?" shirt I bought at Blazer Village the Saturday after we beat them, as well as a 58-56 shirt. Tons of autographed posters and media guides. My degree and my picture of Little Smaug with Coach Bartow. I am pretty sure that I possess the only Derrick "Pookie" Bentley jersey in existence. I have a few other cool things too. 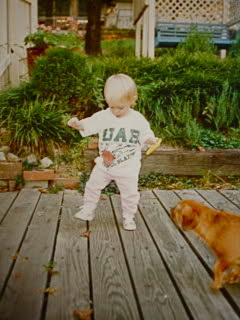 My favorite would have to be my jersey from the very first UAB baseball season. (08-21-2018 06:23 PM)bftb Wrote: I am pretty sure that I possess the only Derrick "Pookie" Bentley jersey in existence. Not sure, maybe EBay ? (08-18-2018 03:12 PM)UAB Band Dad Wrote: I've got an "LS Who?" shirt I bought at Blazer Village the Saturday after we beat them, as well as a 58-56 shirt. Tons of autographed posters and media guides. You ought to get Saban to sign that shirt. He might if his wounds from that loss have healed. I’m pretty sure he has had enough happen since then that there are no wounds from that loss remains. If there are any words at all. It was a pretty bad LSU team and took a lot of wounds. That loss hurt LSU fans a lot more than it hurt Saban. Missing two extreme pieces, one is a UAB old School hat, you know the one that had UAB and Birmingham Blazers underneath The UAB on it, Lost it at Lake Eufaula, and a Blazer Football. Two of the ones, I'm missing. Sure, I can come up with a few more missing artifacts as I think about it. Probably this shirt. My kids have worn it now too which is kind of cool.